This luxurious ottoman features beautiful caramel colored, 100 percent leather upholstery for soft, supple comfort. Bun feet and nailhead trim complete the transitional design. 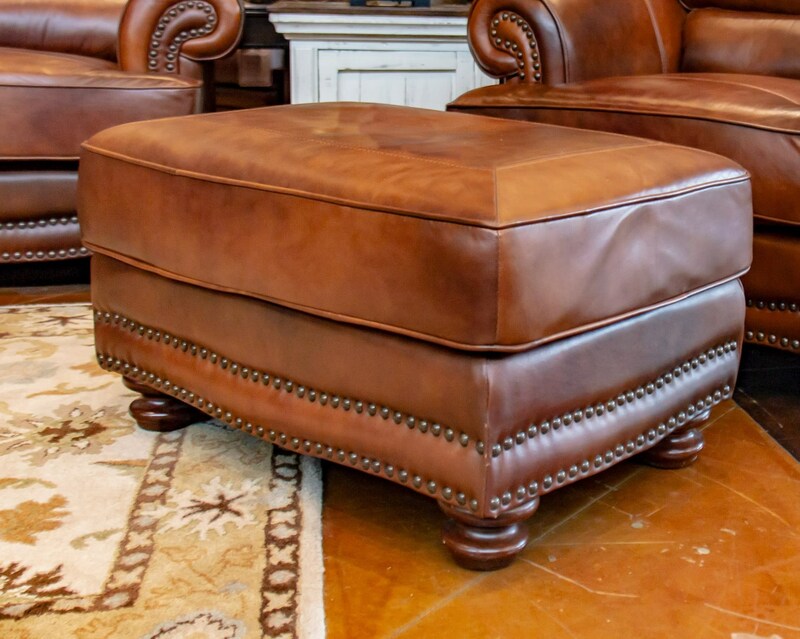 The Cowboy Cowboy Leather Ottoman by LG Interiors at Great American Home Store in the Memphis, TN, Southaven, MS area. Product availability may vary. Contact us for the most current availability on this product. Fabric Options This collection is available in a warm medium brown 100% leather upholstery. The caramel colored leather Cowboy collection offers stylish comfort perfect for the transitional, casual home. Large backrest and seat cushions provide cozy comfort with the feel of soft, supple 100% leather upholstery. Rolled armrests, wood bun feet, and nailhead trim complete the designer look of the cozy Cowboy collection. The Cowboy collection is a great option if you are looking for furniture in the Memphis, TN, Southaven, MS area. Browse other items in the Cowboy collection from Great American Home Store in the Memphis, TN, Southaven, MS area.